In these first weeks 2013 two new papers have been published relying on raptor migration and wintering. The first one is published on Bird Study and shows, through a ringing recoveries analysis, the leap-frog migration patterns of Western Marsh Harriers. Individuals "breeding in Northern and Eastern Europe migrate farther than individuals belonging to the populations within Western and Southern Europe, with no effect of age classes in relation to the latitude of wintering." Moreover "Males show a tendency to migrate longer distances than females" and "when taking into account only birds wintering south of the Sahara desert, juveniles winter further west than adults". The latter result "could be related to the different ability of experienced individuals to compensate for the wind drift of dominant easterly winds during migration over the desert in autumn.". The other paper compares the autumn migration of Western Marsh Harriers and juvenile European Honey Buzzards through Greece. The paper is published on Journal of Biological Research-Thessaloniki. 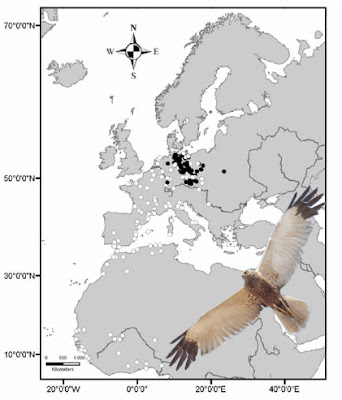 The results of this study show two different migration strategies, the Western Marsh Harriers "migrate through parallel flyways, while juvenile European Honey Buzzards migrate island hopping being attracted by landmarks and following leading lines of land masses.". The reason of this different migratory behaviour could be related to morphological differences in the two species. "A simulation process demonstrated marked differences in the energy consumption rates between the two species, highlighting that the powered flapping flight is particularly more disadvantageous for the European Honey Buzzard rather than for the Western Marsh Harrier". Panuccio M., Mellone U. & Muner L. 2013. Differential wintering area selection in Eurasian Marsh Harrier (Circus aeruginosus): a ringing recoveries analysis. Bird Study http://dx.doi.org/10.1080/00063657.2012.753399. Panuccio M., Agostini N. & Barboutis C. 2012. Raptor migration in Greece: a review. Proceedings of the II Italian Conference on raptors: 16-17, Treviso, October 2012. Catoni C., Santini M., Panuccio M., Massa B. & Dell’Omo G. 2012. Radar applications to study bird behaviour. Proceedings of the XXV Meeting of the Italian Society of Etology: 43, Viterbo, September 2012. Presentations will range among different topics of animal movement research using different methods (visual observations, long-term monitoring programs, radar tracking, GPS, GSM, GLS) and focusing their study on different aspect of bird migration (ecology, ethology, conservation, influence of climate change). Among the speakers Alejandro Onrubia (Fundacion Migres), Giacomo Dell'Omo (Ornis Italica) and the Medraptors staff. Moreover there will be the chance to visit some Important Bird Areas of south-east Sicily. For further information and help in compile the application form and write an email to: Natalia Carpanzano (legambiente.eu.projects@gmail.com).